In the previous articles, we have been discussing various exogenic geomorphic agents like water (running water and groundwater) and glaciers. We have seen the evolution of landforms due to these agents. In this post, we discuss in detail how the wind and the waves cause the evolution of various landforms on the earth surface. 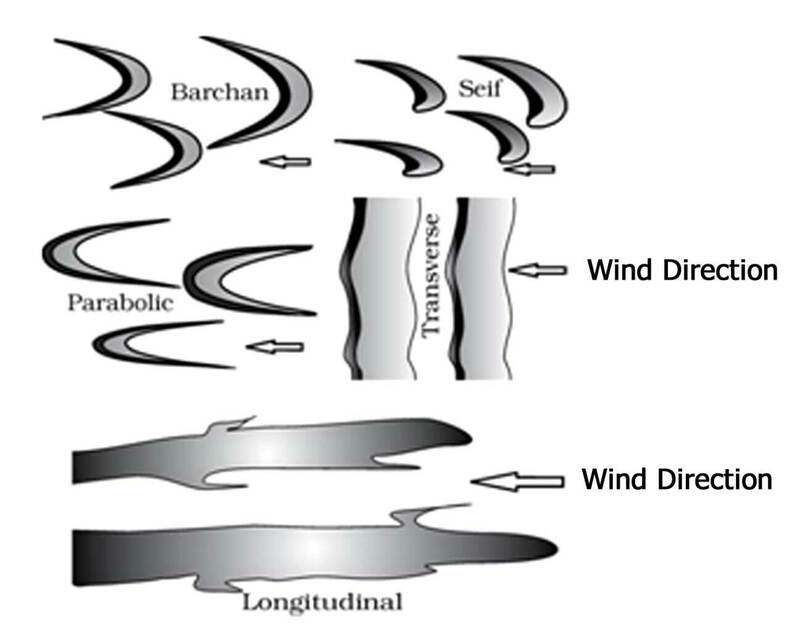 The wind is the main geomorphic agent in the hot deserts. Winds in hot deserts have greater speed which causes erosional and depositional activities in the desert. The landforms which are created by erosional and depositional activities of wind are called as Aeolian Landforms. This process is not unique to the Earth, and it has been observed and studied on other planets, including Mars. An erg (also known as sand sea / dune sea / sand sheet if it lacks dunes) is a broad, flat area of desert covered with wind-swept sand with little or no vegetative cover. It is defined as a desert area that contains more than 125 square kilometres of aeolian or wind-blown sand and where sand covers more than 20% of the surface. Smaller areas are known as “dune fields”. The largest hot desert in the world, the Sahara, contains several ergs. When the high relief structures in deserts are reduced to low featureless plains by the activities of wind, they are called as Pediplains. Deflation is the removal of loose particles from the ground by the action of wind. When deflation causes a shallow depression by persistent movements of wind, they are called as deflation hollows. Ventifacts are rocks that have been abraded, pitted, etched, grooved, or polished by wind-driven sand or ice crystals. These geomorphic features are most typically found in arid environments where there is little vegetation to interfere with aeolian particle transport, where there are frequently strong winds, and where there is a steady but not overwhelming supply of sand. Mushroom Tables / Mushroom rocks are Ventifacts in the shape of a mushroom. In deserts, a greater amount of sand and rock particles are transported close to the ground by the winds which cause more bottom erosion in overlying rocks than the top. 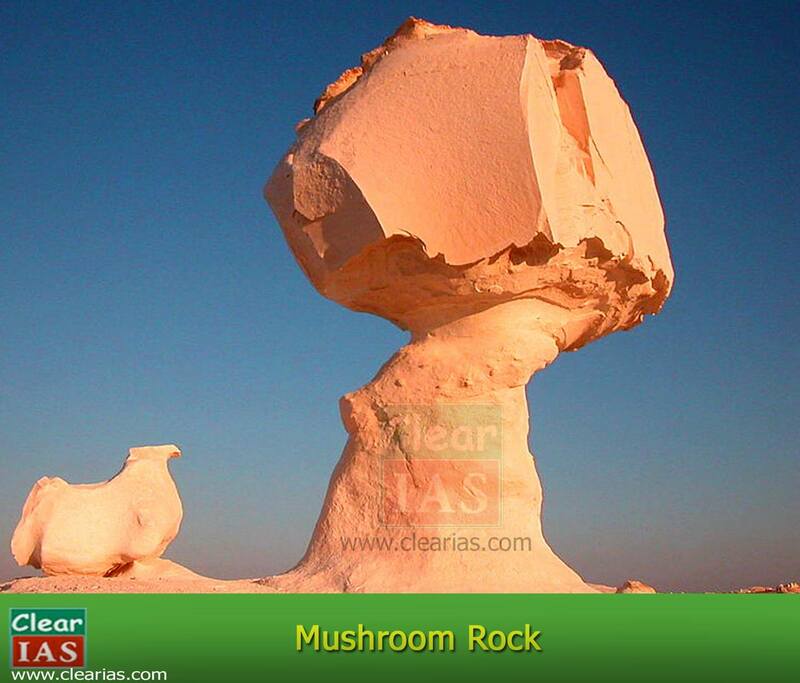 This result in the formation of rock pillars shaped like a mushroom with narrow pillars with broad top surfaces. Dry hot deserts are good places for sand dune formation. According to the shape of a sand dune, there are varieties of sand dune forms like Barchans, Seifs etc. The crescent-shaped dunes are called as Barchans and they are the most common one. Seif is similar to Barchans but has only one wing or point. In several large areas of the world, the surface is covered by deposits of wind-transported silt that has settled out from dust storms over many thousands of years. These depositions are called as Loess. 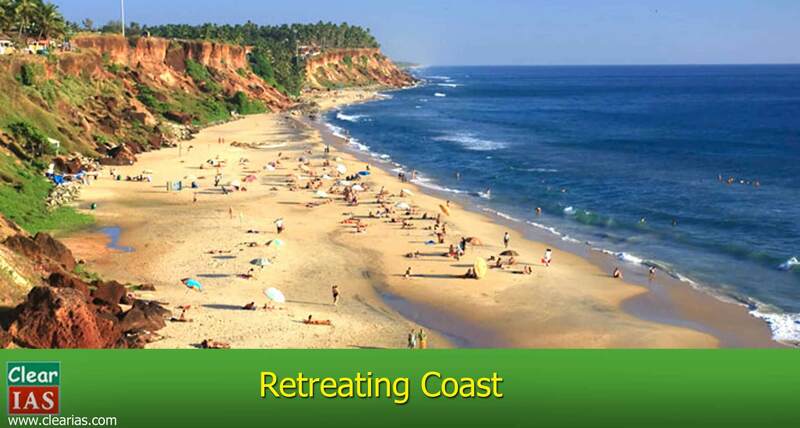 Coastal processes are the most dynamic and hence most destructive. Some of the changes along the coast take place very fast. Storm waves and tsunami waves can cause far-reaching changes in short period of time than normal breaking waves. In these type of coasts, the sea will be very close to the land without any coast or sometimes a narrow coast. The shores of these high rocky coasts do not show any depositional landforms. Wave-cut platforms, cliffs, sea caves etc are common here. Most of the west coasts of the Indian Peninsula belong to this category. The rivers in these coasts extend the length of the coast by building coastal plains and deltas. Thus, depositional features are dominant here. Bars, Barriers, spits, lagoons etc are common on these coasts. 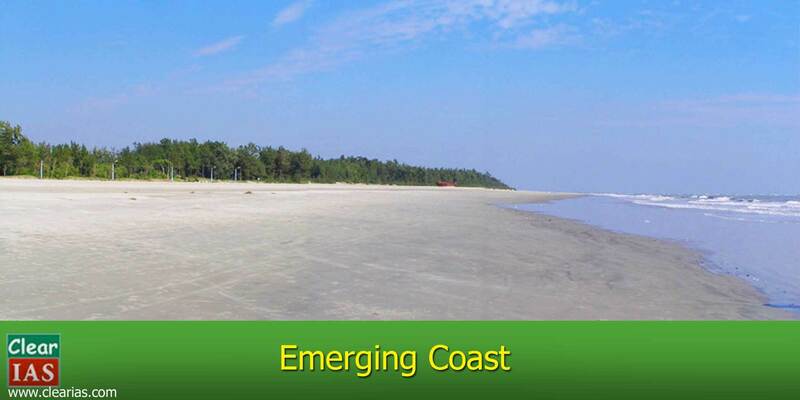 Most of the east coasts of the India Peninsula are of this category. Cliffs are common on the high rocky coasts. At the foot of such cliffs, there may be flat or gently sloping platform covered by rock debris derived from the sea cliff behind. Such platforms occurring at an elevation above the average height of waves is called as a wave-cut terrace. When the upper part of a coastal rock is hard and the lower part is soft, the erosion will not be uniform. The lower part erodes easily which results in the formation of a hollow part. This hollow part, by frequent wave action, gradually develops into a sea-cave. Sea arches are also formed in the same manner. Sea stacks are nothing but the isolated standing rocks in the sea which were once a part of the cliff. These stacks look will like small islands in the sea. Small underwater stacks are known as stumps. Beaches are characteristics of shorelines that are dominated by deposition. Beaches are temporary features which are made up of sand-sized materials. Beaches which contain excessively small pebbles and even cobbles are called as Shingle Beaches. Sand dunes are formed just behind the beaches as long ridges parallel to the coastline. Bars are deposits of sand and gravel laid down by waves and currents which separate the shoreline from the sea. They act as a barrier between the mainland and the sea. When one end of such bar is attached to the coast and other extends into the sea, it is called as a spit. Tombolo is a deposition landform in which an island is attached to the mainland by a narrow piece of land such as a spit or bar. Sometimes due to deposition of waves and currents, both ends of the bar join to enclose a part of sea water between the coast and the bar. This enclosed part of the sea forms a lake of saline water called as Lagoon. A lagoon is generally connected with the sea through a narrow passage. Chilika and Pulicat lakes are examples of Lagoon Lake. Next in the series: Major Landforms – Mountains, Plateaus, and Plains: Learn faster. Thanks for the details. I never knew deeply about this. Thanks for details. I’m not aware of this.